Marquis of Winchester's Writ of Summons. Duke of Suffolk's Writ of Summons. 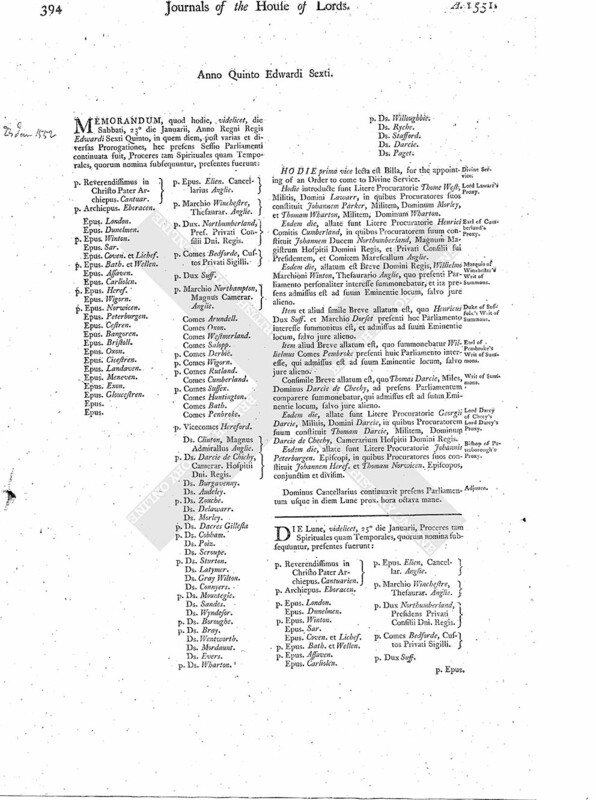 Earl of Pembroke's Writ of Summons. Lord Darcy of Checy's Lord Darcy's Proxy. p. Reverendissimus in Christo Pater Archiepus. Cantuar. Epus. p. Epus. Elien. Cancellarius Anglie. p. Marchio Winchestre, Thesaurar. Anglie. p. Dux. Northumberland, Pres. Privati Consilii Dni. Regis. Ds. Clinton, Magnus Admirallus Anglie. p. Ds. Darcie de Chichy, Camerar. Hospitii Dni. Regis. HODIE prima vice lecta est Billa, for the appointing of an Order to come to Divine Service. Hodie introducte funt Litere Procuratorie Thome West; Militis, Domini Lawarr, in quibus Procuratores suos constituit Johannem Parker, Militem, Dominum Morley, et Thomam Wharton, Militem, Dominum Wharton. Eodem die, allate funt Litere Procuratorie Henrici Comitis Cumberland, in quibus Procuratorem suum constituit Johannem Ducem Northumberland, Magnum Magistrum Hospitii Domini Regis, et Privati Consilii sui Presidentem, et Comitem Marescallum Anglie. Eodem die, allatum est Breve Domini Regis, Willielmo Marchioni Winton, Thesaurario Anglie, quo presenti Parliamento personaliter interesse summonebatur, et ita presens admissus est ad suum Eminentie locum, salvo jure alieno. Item et aliud simile Breve allatum est, quo Henricus Dux Suff. et Marchio Dorset presenti hoc Parliamento interesse summonitus est, et admissus ad suum Eminentie locum, salvo jure alieno. Item aliud Breve allatum est, quo summonebatur Willielmus Comes Pembroke presenti huic Parliamento interesse, qui admissus est ad suum Eminentie locum, salvo jure alieno. Consimile Breve allatum est, quo Thomas Darcie, Miles, Dominus Darcie de Chechy, ad presens Parliamentum comparere summonebatur, qui admissus est ad suum Eminentie locum, salvo jure alieno. Eodem die, allate sunt Litere Procuratorie Georgii Darcie, Militis, Domini Darcie, in quibus Procuratorem suum constituit Thomam Darcie, Militem, Dominum Darcie de Chechy, Camerarium Hospitii Domini Regis. Eodem die, allate sunt Litere Procuratorie Johannis Peterburgen. Episcopi, in quibus Procuratores suos constituit Johannem Heref. et Thomam Norwicen. Episcopos, conjunctim et divisim.